WAVERLY, WV--Beginning riders often 'mythunderstand' rein aids. They initially view them very simplistically in the same purely functional way they view the steering wheel and brakes on their cars. And, to be fair, that is all many new riders can manage in the very beginning. However, as they move up the riding tree and finally gain the holy grail of an independent seat, they learn how to apply rein aids properly as far more than simple indicators of direction and speed. When they can use their seat and leg aids to shape the horse in the direction of travel, to indicate the gait, to set the rhythm, and to regulate the horse's speed and impulsion, they can use their rein aids to manage the subtle coordination of all of these performance parts. Until they have that degree of control over their own bodies, they can work on the 'parts' of applying rein aids correctly until the two come together. For starters, the rider's hands must be in the correct position. Hands should be close together on either side of the horse's withers. As the rider looks down, the thumbs should be the highest point and the pinkies should be closer together than the thumbs. When the hands are in this position, there will be a straight line from the knuckles through the wrists to the elbows. The line of the wrist should neither break toward nor away from the rider's body nor down or up relative to the forearm. The hands should slightly in front of the saddle. Their height above the horse's withers will vary depending on the horse's conformation and frame but the line from the bit to the elbow should never break. The elbows should rest relaxed at the rider's sides. Keeping elbow joints relaxed allows elastic rein contact. Secondly, a steady grip on the reins is essential for steady bit contact. For that reason, I require all my riders wear gloves, especially in hot weather when hands can get sweaty. While the decision to wear or not wear gloves may be an individual one, riders must achieve 'grip' without 'gripping.' If they tense their hand or forearm muscles in order to keep the reins from slipping through their fingers, they cannot achieve the soft, elastic contact that is the ultimate goal. Riders can experiment, if necessary, with reins of different widths or different materials to find a set that allows them to grip the reins comfortably without the kind of gripping that tires muscles and interferes with an elastic feel of the bit. Finally, when horse and rider are in motion, riders must hold their hands steady. This means the hands move neither up nor down, nor side to side, relative to the horse's withers. The steadier the rider's hands, the steadier the horse will move. If a rider's hands wander around chasing contact with the bit as the horse moves its head, the horse will never learn to seek that steady, elastic contact that allows clear communication between horse and rider. Again, the hands should be slightly in front of the saddle and raised above the withers at a height that maintains a straight, unbroken line from the bit to the elbow. Riders cannot achieve truly steady hands until they first achieve an independent seat. That means they are relaxed, balanced over the horse's center of gravity, and can follow the horse's motion at every gait. As they work on that independent seat, however, beginning riders can make a habit of checking their hand position from time to time, especially when making up and down transitions, until they are sure they can 'feel' when it is correct. They should glance down with their eyes rather than tipping their head down which changes their body position and balance. Arena mirrors are useful here. And, as always, feedback about hand position and steadiness from an instructor or friend on the ground is invaluable. With the correct hand position and an independent seat, riders can modify their steady, elastic connection with the bit in four ways: keeping, taking, resisting or giving. 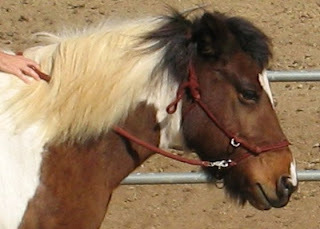 A keeping rein aid is a steady connection that allows whatever the horse is doing to continue. The degree of connection (sometimes referred to as 'weight in the reins' or 'pounds of pressure') is highly variable depending on the horse's conformation and the horse's frame. In a stretching frame the horse stretches the neck forward and down to the rider's hand. In a working frame the horse stretches the neck forward and out to the rider's hand and in a collected frame the horse stretches the neck forward and up to the rider's hand. The rider must learn to accept the contact from the horse as he moves into the hand. Riders sometimes 'give' the rein as soon as they feel the horse coming to their hand. If they do this consistently, the horse will never be able to step to the contact. I tell my students to feel for the horse stepping to their hand. Then they must be sure to keep a steady hand that 'accepts' the contact and closes the circle of aids. If riders give away the connection at the same time they are asking the horse carry more weight on his hindquarters and come under himself, the effect is like squeezing a toothpaste tube with the top open. All of the horse's added energy runs out the front and the horse never achieves the rounded frame the rider wants. A taking rein aid interrupts what the horse is doing. Ideally, riders move only a little finger (or both little fingers) closer to their body. If this is not enough to influence the horse, however, then the 'take' occurs by moving the elbow back. The wrist should never change when taking with a rein. Breaking at the wrist is a common mistake. The degree of pressure on a taking rein will be relative to the response of the horse. The rider will always try to use the least amount of pressure but if the horse does not respond then the pressure will increase. A resisting rein aid follows a taking rein aid and simply means that the rider does not immediately follow the taking rein aid with a giving rein aid. A giving rein aid removes the resistance applied by a taking rein aid. The little finger that moved back in a taking aid now moves away from the rider's body and back into a keeping aid position (or the elbow moves forward again). The amount of giving will be in direct relation to the amount of taking. The taking and giving usually last just a stride until the horse moves forward and back to the keeping rein. Using steady, elastic rein contact to communicate with the horse is far removed from the concept of reins as a steering mechanism. But it takes many, many rides to develop the necessary feel and timing to apply rein aids properly. Pay attention to the successful tries until they become more and more habitual and just keep riding. © 2008 Meredith Manor International Equestrian Centre. Faith Meredith has successfully trained and competed through FEI levels of dressage during her more than 30 years as a horse professional. 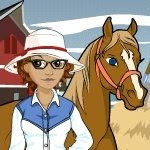 She currently coaches riders in dressage, reining, and eventing in her capacity as the Director of Meredith Manor International Equestrian Centre (147 Saddle Lane, Waverly, WV 26184; 800-679-2603; www.meredithmanor.com), an ACCET accredited equestrian educational institution. I recommend you the website www.saddleonline.com and it has lot of amazing products.